Direct rental service is the most popular mobile shower trailer rentals. We understand the exact customer requirement for the event and provide quality porta potty rentals. Mobile shower trailer is one among those. We help our customers in making their guests feel all the home comforts at the event. 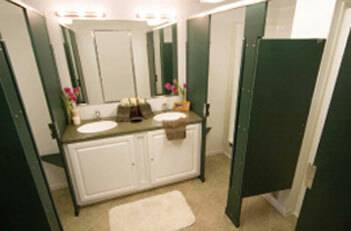 Restrooms with hot or cold water running showers are also provided, but only on special order we do that. The portable mobile shower trailer measurements include 18'x24'x32'. This is perfect for all types and sizes of events. For large parties, on order by the customer, large measurement mobile shower trailer is provided. We do have shower trailer having double sided section for men and women. ADA Mobile Shower Trailer are also available satisfying American Disabilities Act. Self contained and privacy are the main features. Changing rooms for women and men are separated. Water and power is unavailable, generator and water tank facilities are also given. NOTE * Rental units, including color and make will vary from location to location. Co-Operative service providers will attempt to accommodate certain special requests.